It is an ancient Jewish tradition to visit the graves of tzaddikim or of one's ancestors. The Chidah, zt"l, records that as a very young man, he accompanied his rebbi, the Ohr Hachaim Hakadosh, zt"l, to the graves of tzaddikim in Yerushalayim. When Rav Yonasan Eibeschitz, zt"l, was appointed Av Beis Din of Metz, he arrived much later than the community in Metz had anticipated. Since he expected that his knew community would be waiting for him, he sent a message forward to Metz to explain his tardiness. "I have a chovas gavrah, a personal duty, to go to Eibeschitz in distant Silesia to prostrate myself at the graves of my forefathers. They will surely petition Hashem for mercy on my behalf." 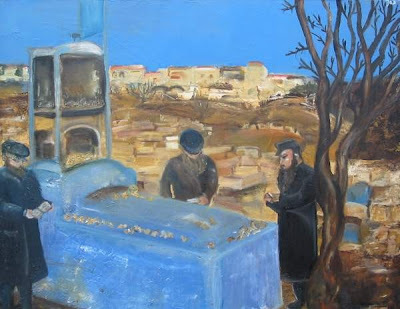 The Chasam Sofer, zt"l, recounted that before the Gaon, Rav Mordechai Bennet, zt"l, died he said, "If the community needs anything after I am gone, they should come to pray at my grave…" When commenting about the status of a cemetery the Chasam Sofer remarked, "It is likened to a shul, since the living often pray there." Rav Huminer concluded, "We see from here that one may even ask the tzaddik to daven on his behalf as Kalev did. Surely if there was anything improper about this the Gemara would have mentioned it!" Rabbi Micha Golshevsky's blog A Fire Burns in Breslov can be seen here. See also this source regarding the necessity of visiting kivrei tzaddikim.